This page contains scientific data and results from the staff of the Institute of Earth Sciences and various collaborators. The data is posted timely to give maximum information on evaluation of an evolving natural catastrophe. Please respect copyright and authorship of the data. Very little activity at Eyjafjallajökull volcano. Small ash clouds are seen occasionally, they disappear again in some minutes. Water accumulation in the crater is slow as the ice is no longer in contact with hot material. 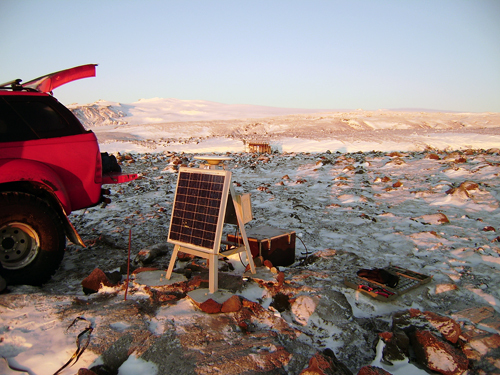 GPS measurements show slight movements towards the mountain except at Austmannsbunga in Mýrdalsjökull, which shows movement towards southwest. No obvious explanation has been found for this movement. Compiled by: Bergthóra S. Thorbjarnardóttir, Magnús Tumi Guðumundsson, Sigrún Hreinsdóttir and Gunnar Sigurðsson. Based on: IMO seismic monitoring; IES-IMO GPS monitoring; IMO hydrological data; web camera; lightning detection system and flights over the eruption site 11 and 14 June. Height (a.s.l. ): Have been observed at over a hundred meters. Lightning: None were measured on the UK Met Office's system. No mudfloods in the past few days. At the eastern, southern and western sides of the crater lake is a wall of ice. On the northern side a tephra wall rises 20 meters above the water. The ice walls at the southwestern corner of the crater are melting, i.e. at the site of the vent that was active 4 – 6 June. The rate of melting is assumed to be about one cuber meter per second. Low tremor level. Pulses are observed off and on. A few small, shallow earthquakes have been recorded beneath the Eyjafjallajökull summit in the last weeks. Thirteen microearthquakes were recorded in the Mýrdalsjökull caldera from 11 to 14 June, most at a shallow depth. The seismic activity beneath Mýrdalsjökull glacier does not appear to be related to inflation of the area. 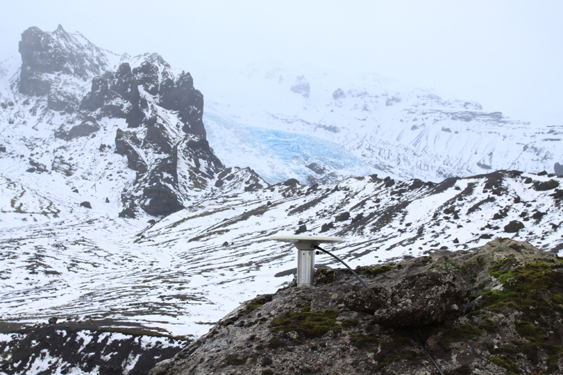 No significant vertical deformation has been observed at GPS stations at or around the glacier. However, a station at the northeastern caldera rim (AUST), moved about three centimeters towards the southwest from the 9th to the 13th of June, inward to the caldera. The level of water in the crater lake only rose about 1 – 2 meters over the weekend. Several days or weeks are therefore likely to pass before the crater has filled with water, and up to months if the melting slows down. It is important that the water level be checked regularly. The water volume is now less than 0.5 million cubic meters. If the water level rises 20 meters, the volume will be 3 million cubic meters. The resulting flood would flow to the north, down the Gígjökull valley glacier, and could reach a maximum of 1500-2000 cubic meters per second. Eruption plume: The strength and tephra content of the plume varies. In afternoon 22 April plume reached temporarily up to 6 km height, but was mostly at about 3 km level. Wind deflects the plume now to NW, closing airports in SW-Iceland. The image below shows the eruption site at the top of Eyjafjallajökull volcano. 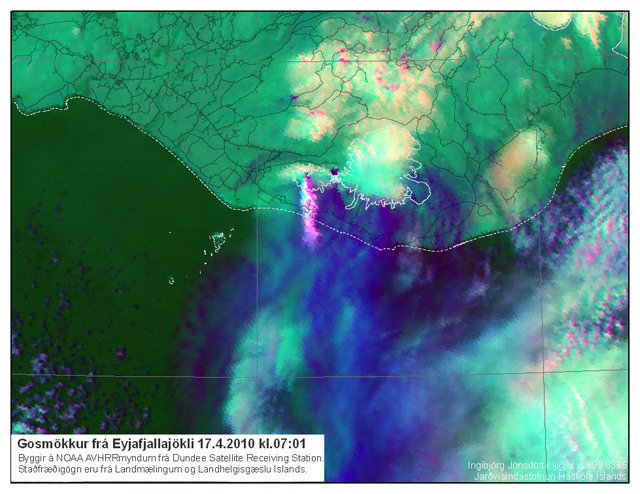 The eruption started at the 14th of April, but the dimensions of the cauldrons on the image are drawn according to a radar image from the Icelandic Coastguard, taken on the 20th of April. The Fimmvörðuháls activity can be seen east of the current eruption site. The background image is from the US/Japan ASTER project, and was acquired on the 19th of April. Viewing the image, it can be seen that the ash has been falling towards the south and east of the eruption site. Note that parts of the glaciers are greyish/black due to the ashfall (i.e. the Sólheimajökull glacier). Seismic tremor recorded by the Icelandic Meteorological Office: Some fluctuations, with a peak shortly after midnight 22 April related to a small flood of meltwater. Since the onset of the explosive eruption the tremor has overall been gradually increasing, with superimposed fluctuations. Visual observations yesterday: Regular explosions at intervals of few minutes were observed in afternoon, with fluctuations in intensity and tephra content. Eruption continues with less explosive activity. Eruption rate is inferred to have declined over last few days and now be an order of magnitude smaller than during the initial 72 hours of the eruption. Present eruption rate is estimated to less than 30 m3/s of magma, or 75 tonnes/s , with a large uncertainty. Eruptive style: The northernmost one of two main craters in the summit caldera is active. Phreatomatic explosive activity occurs with some lava spatter at craters. Seismic tremor recorded by the Icelandic Meteorological Office: some fluctuations but mostly stable. Tremor is not decreasing and does not reflect the decline as inferred for the eruption rate. GPS-measurements: indicate continuing small pressure decrease under the volcano at a similar rate. Composition of erupted material: Samples collected April 19 show same composition as early in the explosive phase, but fluorine content is higher. Samples collected 19 April have 850 mg/kg (initially it was 25-35 mg/kg). This is due to the change in eruptive style – tephra is now not washed to the same extent by water in the eruptive plume. Amount of erupted material: Uncertain but on the order of 100 millon cubic meters. Tephra next to craters is 20-30 m thick. Compiled by: Freysteinn Sigmundsson, Magnús Tumi Guðmundsson, Guðrún Larsen, Níels Óskarsson, Sigurður Reynir Gíslason, Páll Einarsson, Sigrún Hreinsdóttir, Rikke Pedersen, Ármann Höskuldsson, Guðrún Sverrisdóttir, other staff of Institute of Earth Sciences and collaborators. In the first two days of the Eyjafjallajokull volcano summit eruption (14. 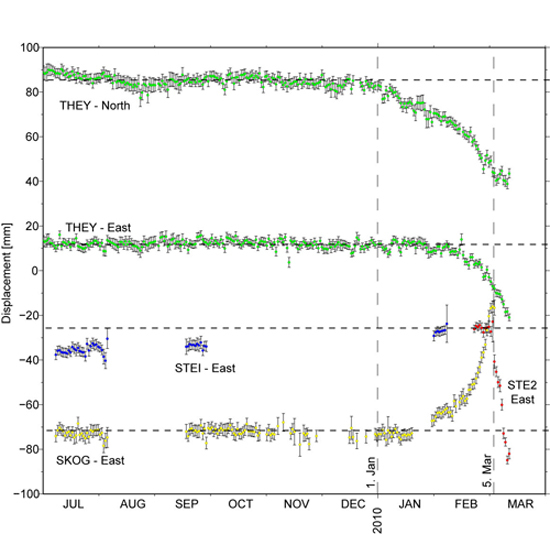 April), two GPS stations located north (STE2) and south (THEY) of the summit crater moved rapidly toward the eruption site (about 6 cm contraction between stations). Modeling of the GPS data suggest deformation due to a volume change of a shallow magma source (1 km depth). This is consistent with chemical analysis of the magma erupted, intermediate chemical composition (58 wt% silica) (Níels Óskarsson). The volume decrease estimated from the GPS data (3-10 million cupic m) is however only a small portion of the volume estimated to have erupted in the first few days (Magnús Tumi Guðmundsson et al.). GPS stations around Eyjafjallajokull volcano (http://notendur.hi.is/runa/eyja_gps.html) show continued deflation of the region, but now at a much slower rate at the stations closest to the summit. This could indicate continued deflation of another and deeper magma source. 1. Material (tephra) in the ice cauldrons around the volcanic vents. 2. Tephra filling the glacial lagoon of Gígjökulslón, carried by floods down the outlet glacier Gígjökull. The tephra is uncompacted, these values corresponds to some 70-80 Million m3 of magma. The average magma discharge rate is about 300 m3/s or 750 tonnes/s. This is 10-20 times the averge discharge rate in the preceeding flank eruption at Fimmvörðuháls. Explosive activity at the eruptive site and seismic tremor continue at a relatively stable rate without a decline overnight. Air space over large part of Europe continues to be closed. Eruption plume loaded with tephra (ash) rises to more than 8 km, with tephra fallout in inhabited areas around the volcano. Over 20 lightning recorded in the eruption plume over a 4 hour period. Overnight wind conditions at the eruptive site change. Steady easterly wind that have prevailed since the onset of the explosive eruptive phase replaced by northerly winds that carry the eruption plume away from the volcano to the south. A MODIS satellite image at 03:41 GMT shows the eruption plume bending from south to east, and a NOAA AVHRR satellite image acquired at 07:01 GMT shows plume heading from the volcano towards the south. 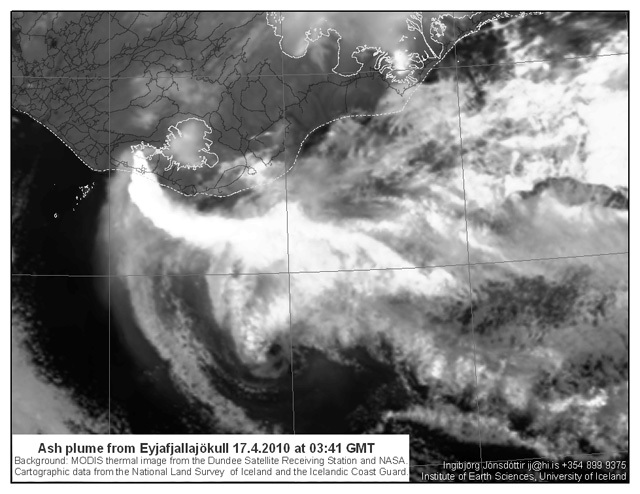 The eruption plume from Iceland that has caused the unprecedentedcatastrophic disruption of air traffic and closure of airspaces over northern Europe is due to an explosive eruptive phase that began at the Eyjafjallajökull volcano on April 14. It is a continuation of eruptive activity in the Eyjafjallajökull volcanic system that began 20 March 2010. During an initial eruptive phase from 20 March to 12 April lava flowed from eruptive vents on the volcano flanks, outside its ice cover. The lava erupted in the initial phase is alkali-olivine basalt, with silica content of about 47%. After a short hiatus in eruptive activity a new set of craters opened up in early morning of 14 April under the volcano’s ice covered central summit caldera. This eruptive phase was preceded with a swarm of earthquakes from around 23:00 on 13 April to 1:00 on 14 April. The earthquake swarm was followed by the onset of seismic eruption tremor. Meltwater started to emanate from the ice cap around 7 o’clock on April 14 and eruption plume was observed in the early morning. 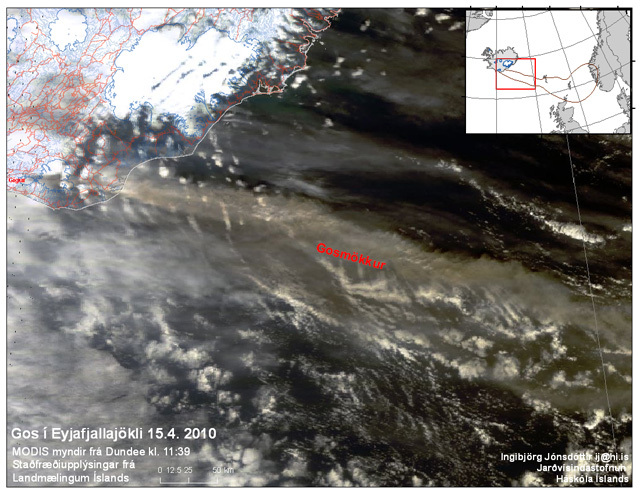 Visual observations were limited by cloud cover over the volcano, but an airplane of the Iceland coast Guard imaged with eruptive crates with radar instrument. 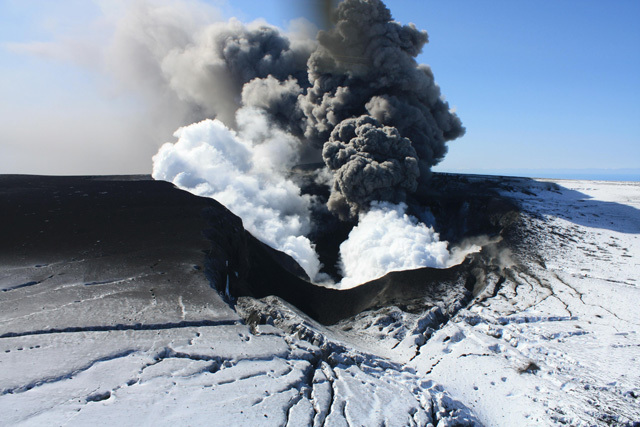 Series of vents along a 2 km long north-south oriented fissure were active, with meltwater flowing down northern slopes of the volcano, but also to the south. Ash loaded eruption plume rose to more than 8 km height, deflected to the east by westerly winds. Jokulhlaups (floods of meltwater) reached the lowlands around the volcano with peak flow around noon on April 14, with destruction of roads, infrastructure, and farmlands. No fatalities as people had been evacuated from hazardous areas. Tephra fall begins in southeast Iceland. A second jokulhlaup/lahar emanates from the ice cap down the Markarfljot valley in the evening. 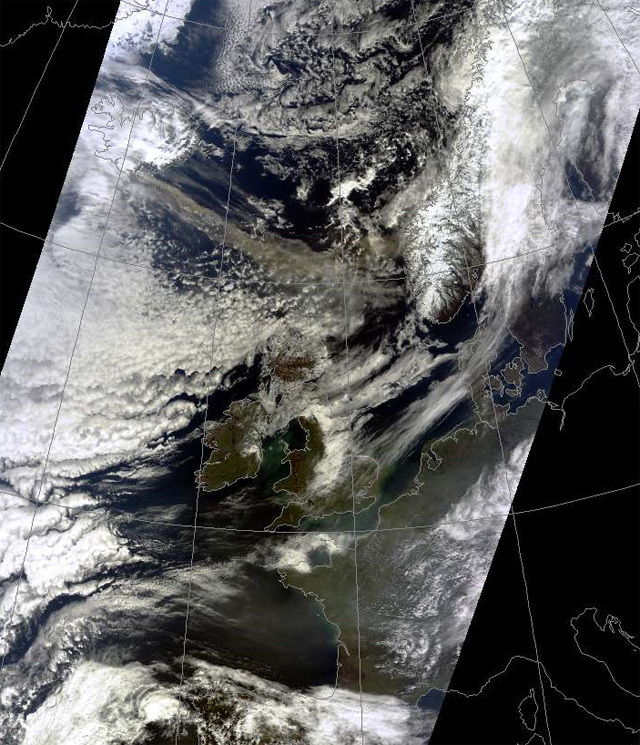 On 15 April the eruption plume reaches mainland Europe with closure of airspace over large part of Northern Europe. Activity continues at a similar level with ash generation and flow of meltwater in pulses. Jokulhlaup/lahar occurs in the evening. On April 16 some variability occurs in seismic tremor and tephra generation, but overall the eruptive activity remains stable. Pulsating eruptive plume reaches above 8 km, with overall height of 5 km. Large closures of airspace continue. Chemical analyses of ash samples reveal fluorine rich intermediate eruptive products with silica content of 58%, more evolved than in the initial lava producing phase of the eruptive activity. The magma composition may reflect evolution from alkali-olivine basalt by crystal fractionation as erupted in the initial phase. Steinunn Jakobsdottir (ssj@vedur.is), Kristin S. Vogfjord (vogfjord@vedur.is), Sigurlaug Hjaltadottir (slauga@vedur.is), Gunnar B. Gudmundsson (gg@vedur.is), Matthew J. Roberts (matthew@vedur.is), Icelandic Meteorological Office, Reykjavik, Iceland. 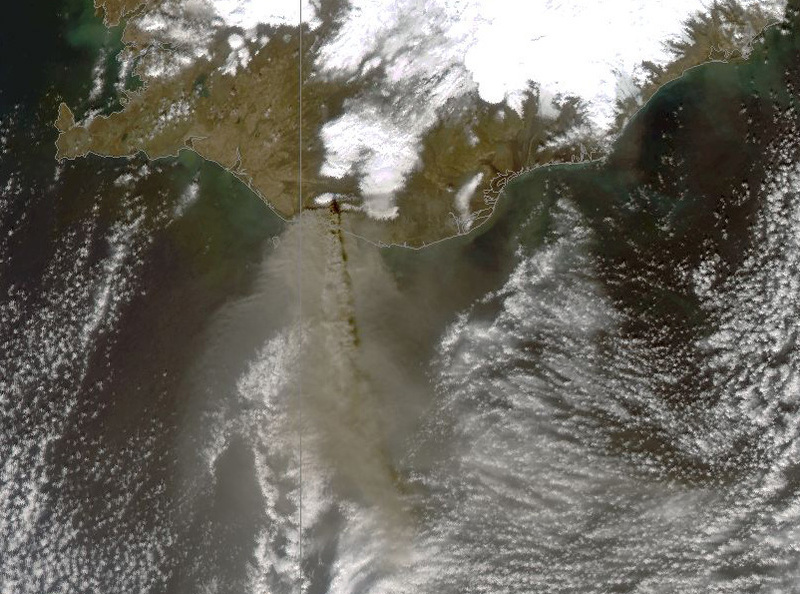 Eruption plume from Eyjafjallajökull seen on MODIS image taken on April 15th at 11:39. A new phase of the Eyjafjallajökull eruption started around midnight on the 14th of April, where melt penetrated its way to the central crater beneath the glacier. Bad weather makes visual observations difficult, but surveillance flights with radar and temperature sensors will shed light on the new conditions later today. 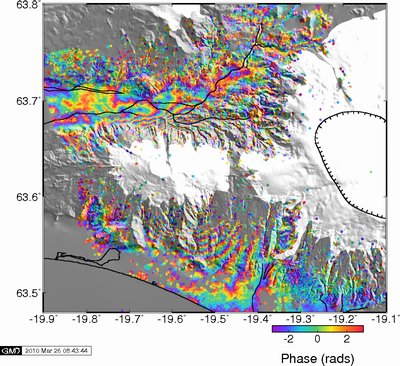 First interferometric analysis of synthetic aperture radar images acquired by satellites reveal extensive deformation associated with a magmatic intrusion under Eyjafjallajökull preceding the eruption. The deformation signal appear as colour fringes, where each fringe represents a change in range from ground to satellite of 1.5 cm. Extensive deformation is observed both north and south of Eyjafjallajökull. The two images show a large change in range from ground to satellite between September 1999 and March 20, 2010, just prior to the eruption that began around 22:30 GMT. These are the first in a series of interferograms anticipated to be formed showing the course of the eruption. 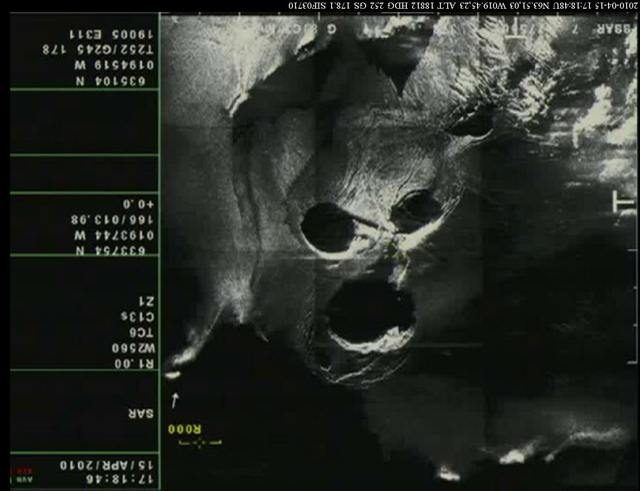 The interferograms are formed by analysing images from the German TerraSAR-X satellite. The research is a collaborative project between the Nordic Volcanological Center at the Institute of Earth Sciences, University of Iceland, the Technical University of Delft, Netherlands, and the University of Wisconsin-Madison, USA. The initial interferograms have been formed by Andy Hooper at Delft. 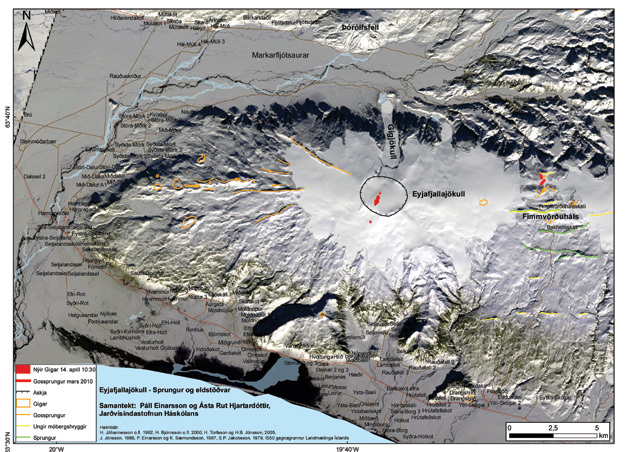 GPS measurements from Thorvaldseyri (THEY), south of the Eyjafjallajökull volcano, now show displacement towards north. The station had been moving south since the intrusion activity started in the end of December. This change suggests that an equillibrium has been reached in magma flow in and out of the volcano. An eruption began in South Iceland in late evening of 20 March 2010 at the Eyjafjallajökull volcanic system (also known as Eyjafjöll volcano – Global Volcanism Program Volcano number 1702-02=). The initial visual report of the eruption was at 23:52 GMT, when a red cloud was observed at the volcano, lightening up the sky above the eruptive site. The eruption was preceded with intense seismicity and high rates of deformation in the weeks before the eruption, in association with magma recharging of the volcano. Immediately prior to the eruption the depth of seismicity had become shallow, but was not significantly enhanced from what it had been in the previous weeks. Deformation was occurring at rates of up to a centimetre a day since March 4 at continuous GPS sites installed within 12 km from the eruptive site. elevation less than 1 km was deflected by wind to the west. Volcanic explosive index (VEI) is 1 or less. Tephra fall is minor or insignificant. The eruption occurs just outside the ice cap of Eyjafjallajökull, and no ice melting is occurring at present. Satellite data is being used to study the eruption and associated intrusion. Several MODIS thermal images on 21 March show a temperature anomaly where the eruption is occurring. 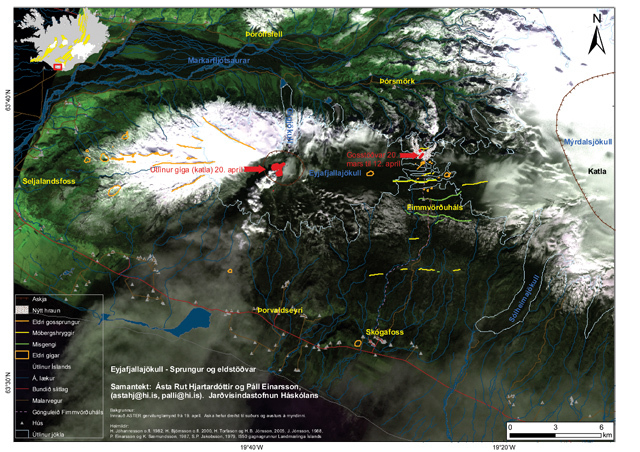 ENVISAT ASAR images before and during the eruption have been acquired, and a series of TerraSAR-X images cover the area. The eruption is located on about 2 km wide pass of ice-free land between Eyjafjallajökull and the neighbouring Katla volcano with its overlying Myrdalsjökull ice cap. Katla volcano is known for powerful subglacial phreatomagmatic eruptions producing basaltic tephra layers with volumes ranging from ~0.01 to more than 1 cubic kilometer. Episodes of unrest are known at Eyjafjallajökull, with documented sill intrusions in 1994 and 1999. Erik Sturkell et. al. 2010. Katla and Eyjafjallajökull Volcanoes, Developments in Quaternary Sciences, vol 13, 5-21. Sturkell, E., P. Einarsson, Freysteinn Sigmundsson, A. Hooper, B. G.Ófeigsson, H. Geirsson and H. Ólafsson, Katla and Eyjafjallajökull volcanoes, In: The Mýrdalsjökull Ice cap, Iceland - Glacial processes, sediments and landforms on an active volcano. Developments in Quaternary Sciences, vol., 13, eds. Anders Schomacker, Johannes Krüger and Kurt H. Kjær, p. 5-21, 2009. Larsen, G., 1999. Gosið í Eyjafjallajökli 1821-1823 (The eruption of the Eyjafjallajökull volcano in 1821-1823). Science Institute Research Report RH-28-99. 13 p. Reykjavík. Pedersen, R., Freysteinn Sigmundsson and Páll Einarsson, 2007: Controlling factors on earthquake swarms associated with magmatic intrusions; Constraints from Iceland, Journal of Volcanology and Geothermal Research,162,73-80. Pedersen, R., Sigmundsson, F., Temporal development of the 1999 intrusive episode in the Eyjafjallajökull volcano, Iceland, derived from InSAR images, Bull. Volc., 68, 377-393, 2006. 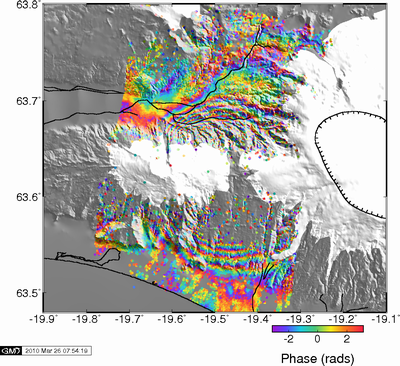 Pedersen, R., F. Sigmundsson,InSAR based sill model links spatially offset areas of deformation and seismicity for the 1994 unrest episode at Eyjafjallajökull volcano, Iceland, Geophys. Res. Lett., 31, L14610, doi:10.1029/2004GL020368, 2004. Three continuous / semi-continuous GPS-sites around Eyjafjallajökull have provided important constraints on the evolution of the intrusion. These are sites south of the volcano at Þorvaldseyri (station THEY) and at Skógaheiði (SKOG), and north of the volcano at Steinsholt (STEI and STE2). THEY and SKOG are steel quadripod stations and STEI and STE2 are tripod and steel rod stations, respectively. From the preliminary GPS results three phases in the signal development can be identified: (i) the first one started at the end of December by a southward motion of THEY, (ii) at the beginning of February, the direction of displacement at THEY changed to the SW, at the same time as eastward motion of station SKOG began, (iii) since the 5th of March, rapid deformation is observed at STE2, both towards north west and up.